Auburn's Unclaimed National Championships | The book that explains why Auburn University should claim a National Championship for the 1910, 1913, 1914, 1958, 1983, 1993, and 2004 seasons in addition to the 1957 and 2010 National Championships. Auburn’s Best Defense Ever Led the 1914 Tigers to an Undefeated Season Now Recognized as a National Championship. It’s the 100th Anniversary of Auburn’s 1914 football season, and that squad’s success on the gridiron should be celebrated. After all, with an 8-0-1 season that included a victory over the famous Carlisle Indians, Auburn’s has been retroactively named a national champion for 1914 by notable selector James Howell using his Power Ratings Formula. So, let’s take a look back at that great Tiger team. 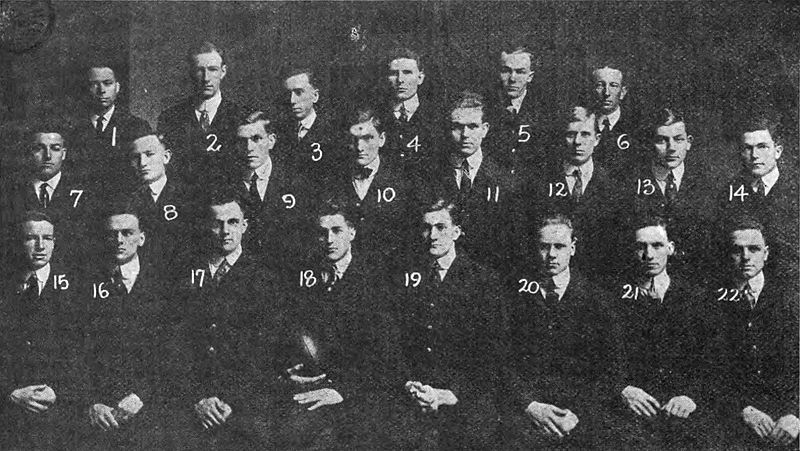 The 1913 national championship team, perhaps Auburn’s most dominant team ever, only allowed 13 points to opposing teams over a rugged 8-game S.I.A.A. schedule. However, the defense on the 1914 Tigers was even more dominant. Auburn was the only college football team that year to shut out EVERY opponent over a 9-game schedule. 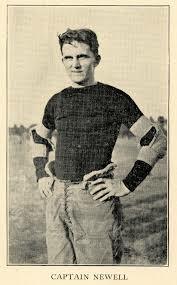 Having lost many of the stars of the 1913 squad, such as the speedy Kirk Newell, to graduation, Auburn’s power running offense had to be rebuilt. With inexperience on offense, head coach Mike Donahue relied on an impenetrable defense to lead the Tigers to victory time and again. Donahue’s base defense was a 7-2-2 that featured larger interior linemen and then fast “smashing ends” whose assignment as to get into the backfield and disrupt the opposing offenses before the play could start. Donahue’s aggressive defense was a powerful response to the “open”offenses” favored in this era by coaches such as Glen “Pop” Warner, who Auburn would encounter late in the season. 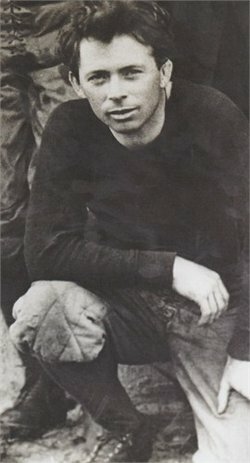 To strengthen his defense, Donahue moved halfback Richard “Bull” Kearley from halfback to one of his “smashing” end positions to add speed to his defensive line. On offense, Donahue moved quarterback Ted Arnold to one of the halfback spots to replace the lost speed and started Legare “Lucy” Hairston at quarterback. After Auburn had crushed opponents left and right in 1913, Coach Donahue had a bit of trouble completing a schedule for 1914 and had to start the season with “warm up” games against Marion Military Institute and Hamilton Agricultural School. After quickly dispatching those teams, Auburn moved on to traditional rivals. Auburn beat Florida 20-0 in Jacksonville, Fla., and then Clemson 28-0 and Mississippi State 19-0 in home victories. Next up was old foe Georgia Tech, led by John Heisman, at Grant Field in Atlanta. Auburn would wear numbered jerseys for the first time in this game. Led by Bull Kearley’s three fumble recoveries, Auburn would cruise to a 14-0 victory over a strong Tech team. In fact, not counting the losses to Auburn, the final record of the Tiger’s last four opponents, all conference foes, was a cumulative 22-5-3. Next up was a trip to Birmingham to play powerful Vanderbilt before 10,000 fans packed into Rickwood Field. Auburn had beaten Vandy the year before by a score of 14-6 to seal an S.I.A.A. championship. On a rain-soaked, muddy field, “Iron Mike” Donahue’s defense held strong the entire game. Not once, not twice, but three times the defense rose to the occasion and stopped Vandy on fourth down in the fourth quarter and preserved a 6-0 victory that show that the prior year’s victory had been no fluke. Auburn had replaced Vanderbilt as the dominant Southern football power. Auburn next traveled to Atlanta for its rivalry game against the Georgia Bulldogs. Though field conditions were no problem, both teams had trouble moving the ball against strong defenses. Georgia twice neared Auburn’s goal line, only to be turned away by jarring blows from Tiger defenders that caused fumbles Auburn recovered. Auburn’s chance for a victory ended when halfback Frank Hart was caught from behind near the Georgia goal line as time expired, leaving the game a scoreless tie. Auburn’s final game of the 1914 season was a fan spectacular set up against the Carlisle Indians of Pennsylvania as Atlanta’s first intersectional college football game. It matched two of the premier teams of 1913, when Auburn had gone 8-0 and Carlisle 10-1 (even without Jim Thorpe, who had moved on to pro football). 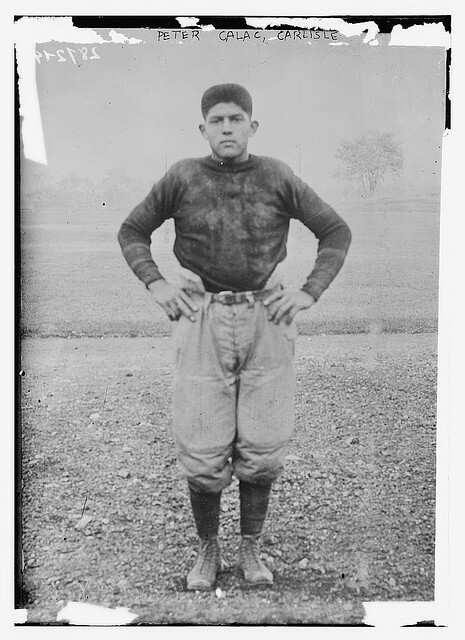 Carlisle was led in 1914 by its imposing All-American fullback Pete Calac, who had the size and speed of today’s running backs and would go on to play 10 years of professional football. A traveling team, Carlisle’s “B” team had dispatched the University of Alabama the weekend before in Birmingham by a 20-3 score and Calac, well-rested, declared that Carlisle would have no problems beating Auburn. Led by the great “Pop” Warner, who would later go on to coach at Georgia, Carlisle’s offense featured trickery – such as reverses and two or even three pitches of the ball – on almost every play. But he had not met a team with a defense powerful enough to stop Calac’s inside runs and the speed and aggressiveness to control sweeps to either side. The game remained a scoreless tie until late in the fourth quarter when Auburn quarterback Lucy Hairston completed a pass to bring Auburn near the Carlisle end zone, and then kept it himself to win the game with a 6-yard scoring run that showed the college football world that Auburn was truly a national powerhouse. This 1914 Tiger team ranks with the best teams in Auburn history and it should receive all the respect and recognition from Auburn’s Athletic Department and its fans that it deserves by raising – on its 100th Anniversary – a national championship banner in Jordan-Hare Stadium. Read more about Auburn’s 1914 team in the Auburn’s Unclaimed National Championship book. Yet Another National Championship Selector Named Auburn a National Champion for 1983 and 2004. I recently discovered yet another national championship selector who, though unrecognized by the NCAA, nonetheless has an interesting system for choosing a national champion for college football.The Quality Champions System of Brian McAtee, is based on a mathematical system developed to reward a winning team’s strength of schedule above all else. The Quality Champions System, begun in 2001, has named a national champion for every season between 1977 and 2010. Given what I know about the strength of schedule of Auburn’s 1983 and 2004 teams, it was not surprising to see them named as national champion for those seasons, in addition to the 2010 season. There is an old adage about football in the Southeastern Conference: “to win games you’ve got to run the ball and stop the run.” Another adage is that “defense wins championships.” Auburn people know these sayings are still true today even in the era of spread offenses and wide-open passing attacks. The sayings also applied in an era of football even older than the birth of the SEC in 1933. In the early days of Southern football, the teams of more than a dozen universities played in the Southern Intercollegiate Athletic Association and football was a physical, hard-nosed sport played by young men in leather helmets and uniforms with little padding. Passing attempts were a fairly common occurrence, but games were won by running the ball and stopping the run. Perhaps no team in the history of Auburn football embodied this rule more than the 1913 team, which was led by Hall of Fame coach Mike Donahue. A former quarterback at Yale, a powerhouse program of that day, Donahue brought a rugged Eastern-style football to Auburn when he arrived as the new head football coach in 1904. His offense was built off the inside dive play ran by an alternating stable of powerful fullbacks that bludgeoned opposing defenses. That staple play was then countered by sweeps from speedy halfbacks and an occasional pass or run from the quarterback. On defense, Donahue ran a 7-2-2 defense that featured larger linemen and “smashing ends” whose assignment as to get into the backfield quickly and disrupt the opposing offenses — who often ran reverses and plays with two or even three pitches of the ball – before the play could start. Donahue’s aggressive defense was a powerful response to the “open”offenses” favored in this era by coaches such as Glen “Pop” Warner. By 1913, Donahue had his program well-established and had all the players needed to field a dominating football team, perhaps the most dominating in Auburn history. The team of a little over 20 players was led by star halfback and team captain Kirk Newell. Newell had blazing speed and, though small in stature, a powerful lower body. His speed and leg strength were developed by a hobby of chasing rabbits as a young boy. Led by Newell, who gained more than 1700 yards in just 8 games, Auburn went undefeated against a very difficult schedule, outscored its opponents by the amazing margin of 223-13, while playing only two games in Auburn. While there were no national championship selectors in 1913, and certainly no newspaper editors in the North that would recognize Auburn as a national champion, the 1913 team took pride in its undefeated season, conference championship, and being named “Champions of the South” by regional newspapers. However, this Auburn team has subsequently been named a national champion for 1913 by six national championship selectors. Among these is Richard Billingsley, of the Billingsley Report, whose mathematical system for determining a college football champion was used in the BCS formula and who is an NCAA-recognized selector. With this award, Auburn’s 1913 team is the very first team in the South named a national champion by any NCAA-recognized selector. There is a book published in 1992 on the centennial of the Auburn football program by Wayne Hester titled, “Where Tradition Began.” From the first football game played in the Deep South to the first national championship by a Southern team, that title holds true. Auburn is where Southern football tradition began. And it should be celebrated. Yet this great, dominant team, its players and Hall of Fame coach, are overlooked by most Auburn fans, as if the bruises, injuries, and blood spilt on the gridiron by these players for the glory of Auburn is not worthy of all the honor and respect it is due simply because it occurred just over a century ago. In my view, the opposite should be true. This great team, composed of rural farm boys, many of whom were greenhorns to the sport and who had never seen a football game before beginning practice, bested college teams composed of players hand-picked from local high schools that were already playing the game. 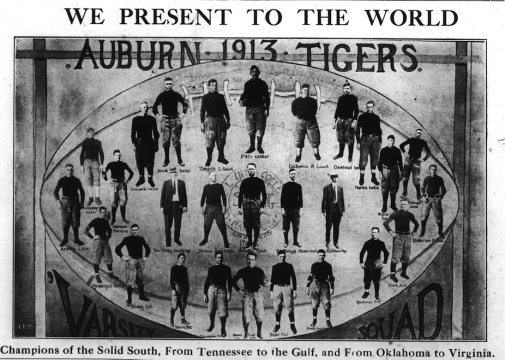 This 1913 Tiger team ranks with the best teams in Auburn history and it should receive all the respect and recognition from Auburn’s Athletic Department and its fans that it deserves by raising a national championship banner in Jordan-Hare Stadium, and including it with all the other championships that Auburn chooses to “acknowledge” in signage on the stadium. Read more about Auburn’s 1913 team in the Auburn’s Unclaimed National Championship book. Auburn University Has Already Acknowledged the 2004 Tigers Are National Champions. acknowledging” that additional national championships have been won by its football program has been on the 1913, 1983, and 1993 seasons for which Auburn is recognized by the NCAA as a national champion. These three seasons, along with a link to the Official NCAA Records Book, are now found on the Athletic Department’s web site for the football program. However, as noted in the Auburn’s Unclaimed National Championships book, Auburn’s undefeated (13-0, SEC Champions) 2004 team also has a claim to the national championship that year based on several selectors. 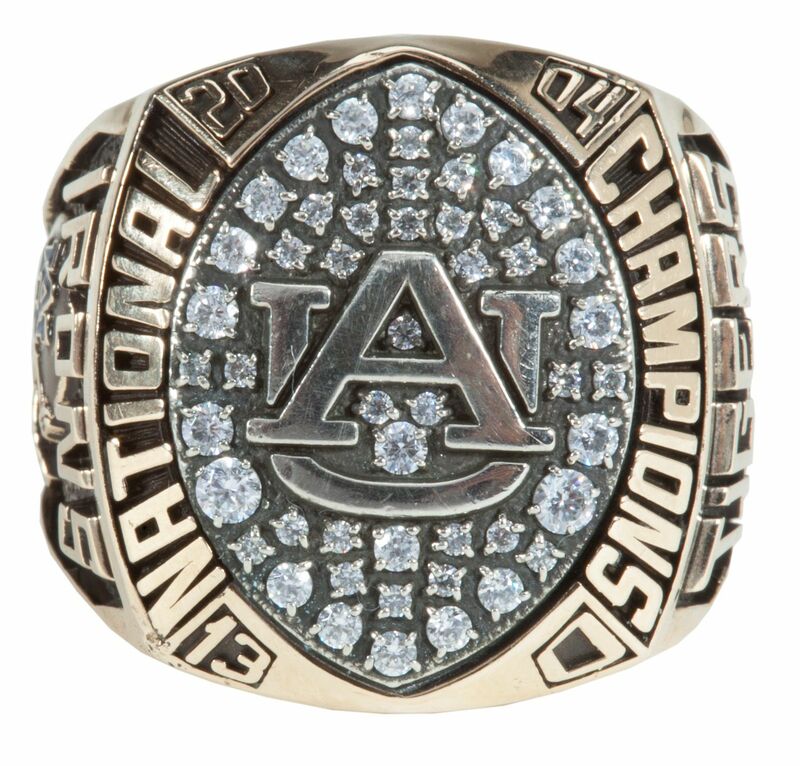 Whether acknowledging those selectors or not, Auburn University felt strongly enough about its claim to a national championship for the 2004 season that it gave its players and coaches “national champions” rings. So, if Auburn chooses this year to more outwardly acknowledge its championship claim for the 2004 season, it won’t have done so retroactively. It did so immediately following the 2004 season some 10 years ago. Auburn’s claim to the national championship is strengthened by the fact that the consensus champion for that season, the University of Southern California, later had its championship stripped by selectors other than the Associated Press because the NCAA determined it had won those games while knowingly playing a star player who was actually ineligible because of receipt of improper benefits. The Auburn University Athletic Department recently modified the content on its website for the football program to include a reference to the fact that the 1913, 1983, and 1993 teams have each been named a national champion by NCAA-recognized national championship selectors. When the change was identified by someone, it apparently caused a stir with persons who were indignant that Auburn should have the gall to claim national championships based on the same standards used by other football programs nationally, including in the SEC. Of course, while Auburn may decide to claim additional national titles, it had not done so at that time, but had just more prominently featured information about those three teams that had long been noted in Auburn’s football media guides. The web site for the University of Georgia’s football program does much the same regarding several of its teams. However, none of that prevented fans and sports media personalities from offering fast-paced put-downs in response via twitter commentary. I offer the following tweets from USA Today writer Dan Wolken, a Vanderbilt graduate, who sought to especially debunk any Auburn claim to a national championship for the 1993 season. His tweets were not anything remarkable, but because they are representative of the types of comments made by hand-wringing media persons, they are worth discussing. While it is true that the NCAA doesn’t award national championships in what was once called Division I college football, that is the problem. Since 1926 there have been many entities, often called “selectors” that name national champions (both contemporaneously and retroactively), and in many years, if not most, more than one team has been awarded that title. The Official Record Book of the NCAA lists a large number of selectors that it has found credible and provides the teams those selectors have named as national champions. Thus, while the NCAA has not itself awarded any team the title of national champion, it has recognized Auburn as a national champion for 1993, 1983, and 1913, in addition to the national championships claimed by Auburn for 1957 and 2010. The standard of an NCAA-recognized national championship is the standard used by most universities to claim national championships, whether it be the 15 claimed by the University of Alabama or the 3 claimed by Texas A&M University. If other universities used the same overly strict standard of counting just A.P. Poll/Coaches Poll/BCS currently used by Auburn’s Athletic Department then Alabama would claim 10 instead of 15, the University of Michigan could claim just 2 instead of 11, the University of Pittsburgh could claim just 2 instead of 9, Ohio State University could claim just 5 instead of 7, the University of Tennessee could claim just 2 instead of 6, and the University of Mississippi could claim none, but claims 3 national championships. So when Auburn Athletic Director Jay Jacobs has talked about Auburn possibly beginning to count national championships in the same manner as peer institutions, he is correct that to this time Auburn has used a different standard. A stricter standard. And that is the point of my book. Mr. Wolken apparently took great umbrage in particular at the possibility of Auburn claiming a national championship for the 1993 season. He stated in colorful terms that he didn’t believe the National Championship Foundation — the selector that named Auburn a national champion for the 1993 season — had any credibility. For those unfamiliar with the “Human Fund,” it is a make-believe charity invented by the character George Costanza in the popular television comedy series “Seinfeld.” Instead of giving gifts, George would give persons a card stating that a donation had been made in their name to the Human Fund. George would then spend the money on himself. In Seinfeld, hilarity ensued following George’s creation of the Human Fund, and through his attempting-to-be-clever tweet, Mr. Wolken sought by comparison to ridicule any claim to a national championship based on an award of the National Championship Foundation. However, perhaps it is Dan Wolken and others who would attack the NCF that actually lack credibility. After all, a fictitious or shoddy organization is not going to pass muster and become an NCAA-recognized national championship selector listed in the Official NCAA Records Book. Moreover, if Mr. Wolken had actually contacted the NCAA or undertaken a bit of the research he described in his tweet he would have discovered that the NCF was actually a substantial organization that contemporaneously named Auburn a national champion for the 1993 football season and that Auburn has been recognized as such by the NCAA since that time. I don’t know about Mr. Wolken or other sportswriters and media personalities, but to me that sounds like the NCF was a substantial organization worthy of some respect. It certainly has been shown respect by the NCAA by its inclusion on the list of national championship selectors. Perhaps he is simply upset at the idea of the sports media not being able to control who is named a national champion or what selectors a university football program may deem credible. Perhaps he feels particularly qualified to judge which teams are and which teams are not able to wear the title of national champion for seasons in the past. Perhaps he simply wants Auburn to continue undervaluing its championship heritage. You can decide Mr. Wolken’s motivation for yourself. It’s notable that Mr. Wolken additionally advances the specious argument that Auburn was ineligible to be awarded a national championship in 1993. It’s one thing to claim national titles from older eras where polls and details were fuzzy. Claiming one when you were INELIGIBLE is bunk. Of course, it is true that Auburn was on NCAA probation in 1993 and received a bowl ban based on violations deemed to have been committed by the prior coaching staff. But it simply not true that Auburn was “ineligible” for a national championship. Auburn was eligible and was indeed voted number one by several voters in the Associated Press’s final poll for the 1993 season. In fact, of all the national championship selectors recognized by the NCAA, only the “Coaches Poll” has ever excluded consideration of teams on NCAA probation. Moreover, teams on NCAA probation have been awarded a national championship as recently as the University of Alabama in 2009. Even during the pre-BCS “bowl era,” a bowl ban did not disqualify a team from being awarded a national championship, as evidenced, for example, by the University Oklahoma’s consensus national championship in 1974. If Mr. Wolken still believes it inappropriate that Auburn should recognize that its undefeated 11-0 football team was named a national champion by a single selector in 1993, perhaps he should express similar indignance and toward the national championships claimed by the University of Alabama for its 9-2 team in 1941 (Houlgate System), which Alabama formally claimed in 1986, and by the University of Tennesee for its 9-2 team in 1967 (Litkenhous Ratings), and others as well. However, I’m not going to bother to hold my breath waiting for that USA Today news expose. In the meantime, I’m proud to say that Auburn’s undefeated football team, which beat two top 10-rated teams (including the defending 1992 national champion) was named a national champion for 1993 by the NCF. Perhaps Mr. Wolken, who appears to have still been in grade school that year, fails to remember the 1993 season. But the resume of the 1993 Auburn team exceeds that of several past teams well accepted as national champions, such as Brigham Young University in 1984, the University of Pittsburgh in 1976, the University of Oklahoma in 1974, Ohio State University in 1961, and Louisiana State University in 1958. Moreover, the 1993 Auburn team did not go undefeated as a fluke. The team was filled with star players who would go on to very lengthy NFL careers, such as offensive linemen Wayne Gandy, Willie Anderson, and Anthony Redmon; running backs Tony Richardson and Stephen Davis, receiver Frank Sanders, and defensive linemen Willie Whitehead and Gary Walker, as well as other key players who were drafted by NFL teams. There is simply nothing inappropriate about Auburn University recognizing that its football team was a named a national champion by the NCF in 1993, and it’s the right thing to do. I believe Auburn’s Athletic Department should claim that championship and the other national championship seasons described in the “Auburn’s Unclaimed National Championships” book. Mr. Wolken, like everyone else, is welcome to have a different opinion. But let’s make sure that differing opinions are based upon the facts and that the manner in which other universities treat NCAA-recognized national championships is acknowledged. Expressing instantaneous opinions on twitter or talk radio without sufficient investigation just to attract attention or gain internet page hits at the expense of Auburn University and fans of its football program doesn’t speak well of the professionalism of sports journalism. In the end, the facts of this “controversy” are this: credible, independent national championship selectors have named Auburn’s 1913, 1983, and 1993 football teams as a national champion for those seasons and those championships are recognized by the NCAA, college football’s governing body. Auburn University has acknowledged such on its website for the football program and may take the position of asserting that those are indeed national championship teams. Faux outrage from fans of other schools and certain sports media persons that will last mere weeks at most — such as that briefly expressed two weeks ago — shouldn’t prevent the Auburn Athletic Department from also recognizing and fully celebrating such accomplishments, as have other college football programs, both nationally and in the SEC. The coaches and players of those Auburn teams who worked so hard and reached such great success on the gridiron deserve as much. The views and opinions expressed here are those of Michael Skotnicki, individually, and do not necessarily represent or reflect those of Auburn University or its Athletic Department. $5.00 Discount Code Through December 15. Other Schools Don’t Apply Auburn’s Overly Strict Standard for Claiming National Championships. As Auburn is now set to play for the 2013 BCS National Championship, it’s worth it to take the time to think about Auburn’s past national championships that were won but are yet unclaimed. Auburn Honored the 1913 Team During Halftime of the Georgia Game with this Video. 30 Year Anniversary: The Top 10 Players on Auburn’s 1983 National Championship Team. Like the 1913 (8-0) and 1993 (11-0) teams, Auburn’s 1983 team is recognized by the NCAA as a national champion. Auburn’s 1983 team went 11-1 (6-0 in SEC) against a schedule that Richard Billingsley (of BCS computer formula fame) has ranked the 5th most difficult schedule in the entire history of college football. This was a team full of great players, but the following is my list of the top 10. 1. Vincent “Bo” Jackson There is no suspense or debate about this pick. Bo still holds most of the Auburn rushing records, was the Heisman Trophy winner in 1985, and ESPN readers recently voted him the Greatest Athlete of All Time over such luminaries as Jim Brown, Muhammad Ali, and Michael Jordan. What more needs to be said – we all know how good Bo Jackson was in 1983. 2. Donnie Humphrey Coach Pat Dye‘s teams in the mid- to late-1980’s were strong and deep on the defensive line, but that depth hadn’t been fully developed by 1983 and Donnie Humphrey was a standout whose quality of play at defensive tackle ranks with notables such as Ken Rice and Tracy Rocker. Not only did he play strong against the run, he had the ability from his defensive tackle position to rush the passer and anchored the defensive line, as he did in a short NFL career. 3. Greg Carr Carr was a tough-as-nails leader for this defense. A sure, hard tackler, who led the team in that statistic, Carr was also adept at a linebacker’s role in pass defense. It would be hard to find a more complete college linebacker of that era and Carr was named an All-American in 1984. He would continue his career in the NFL. 4. Lionel James Although diminutive even by the standards of the time, James was a strong and physical blocker as well as exciting open field runner. He acted as quite a counterpunch to defenses focusing to stop Bo Jackson and was just about as liable to break a long touchdown run. He would go on to a record-setting NFL career. 5. Al Del Greco Some might say Del Greco, the team’s placekicker, is ranked too high at number five. However, Del Greco was practically a sure bet at kicks of almost any distance and his three clutch field goals in the Sugar Bowl against Michigan and it’s powerful run defense, were the difference in 9 – 7 win and clinched the National Championship for Auburn, as awarded by BCS-formula guru Richard Billingsley and other championship selectors recognized by the NCAA. Del Greco went on to an NFL career that almost lasted two decades. 6. Doug Smith A big and powerful defensive lineman comparable to Donnie Humphrey, he was likely the strongest player on defense. Add in his great toughness and with that combination Smith would go on to All-American status in 1984 and have a long NFL career. 7. Randy Campbell You can’t measure leadership by height and weight or with a stopwatch. Campbell was the leader this team needed, protected the ball in a triple option offense placing an emphasis on the quarterback being nimble in his fakes, smart in his reads and decision-making, and accurate in his pitches to Jackson or James and in the short passing game. With his adept play of the position, Auburn led the nation in fewest turnovers, a key statistic as Auburn faced one of the most difficult schedules in the entire history of college football. 8. Ed West Athough he may be overlooked by some, West is deserving of this spot based on being a model tight end for Coach Dye’s brand of run-first offense. He was an overpowering blocker for the running game and practically an automatic first down on third down when the distance dictated an intermediate pass. He was a clutch performer who went on to a long NFL career. 9. David King He was the leader of the defensive secondary. Even though he was a bit under-sized, King was a three year starter at cornerback and demonstrated great athleticism. A sure and hard hitting tackler, after his first year as a starter opposing team’s recognized his ability and seldom attempted passes to the receivers he covered. If teams in this era had run more passing plays, King would have had the opportunity to move up this list. He would go on to a short NFL career. 10. Tommie Agee Just a freshman in 1983, Agee makes this list because of the big plays he made that year as a fullback in the triple option, where his running ability up the middle kept defenses from keying on the flanks where Jackson and James did their damage on option pitches from Campbell. In addition to great skill as a runner, Agee was a strong blocker and was also a threat in the passing game. Agee would go on to a lengthy NFL career. If you want to suggest other players from the 1983 team as being missing from my list of Top 10 Players, leave a comment to let me know what you think. And if you want to relive some of the highlights of that 1983 season, a chapter of “Auburn’s Unclaimed National Championships” is devoted to that season.